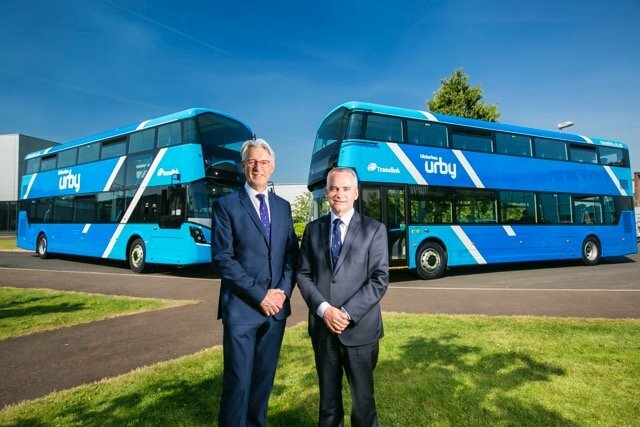 Translink is set to take delivery of 28 new high specification Ulsterbus Double Deck buses, manufactured by Wrightbus, Ballymena. Representing an investment of around £6.7million, the new buses will operate on key commuter routes between outlying towns including park and ride routes and Belfast. They will have a modern and striking new-look livery and come with a range of enhanced on board customer features for an even better journey experience. Chris Conway, Translink Group Chief Executive explained: “We are looking forward to introducing these new vehicles. They will offer the highest levels of comfort with new features such as leather seats, USB charging points and free WiFi. We are also piloting innovative mobile cradle devices on seat backs on some vehicles – this facility is a first in the sector. “The introduction of these vehicles gives us the opportunity to launch a new service brand – Urby, inspired by the number of ‘smarter’ travellers living outside the city and looking for a better way to commute and connect with the city to get more ‘me time’ and enjoy a more active and healthier travel option compared to the car. “We carried record passenger numbers last year – topping 81 million and want to encourage even more people to join the ‘smartmover generation’. However, in order to maintain our high standards, we do need to establish a sustained programme of fleet replacement to maintain the quality, comfort and accessibility of our fleet. It is also important to keep up with the latest technology and environmental features – these new vehicles will be among the most fuel efficient and eco-friendly buses operating in Northern Ireland helping to improve local air quality”, he concluded.